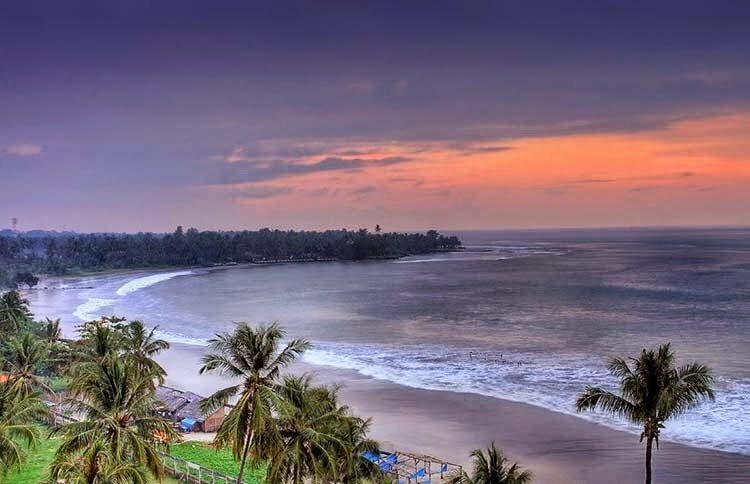 Anyer Beach Most Popular Attractions In Serang – Banten – For those of you who have visited the region of Serang – Banten, Indonesia certainly will not miss to visit one of the most popular tourist destinations of this one, Anyer Beach. This beach in Banten has a myriad of charms that are a pity to miss when we are visiting to Banten. Anyer Beach itself is located in the District Anyer, Serang regency, Banten province and for that beach is named Beach Anyer. Visitors who come here are not only local tourists but also tourists from abroad also often visit attractions Ayer Beach. This is because it is a lot of interesting spots that can amaze every visitor who comes. Not only that the number of facilities that exist here adds its own charm for the visitors who come. Some of the existing facilities such as surfing, snorkeling and many more others you can get here. Anyer is from Anyar word (Anyar City) which formerly according to the legend of the community named Sudi Mampir who is under the royal power of Banten. Sudi Mampir stood since 1667 which means willing to stop by. 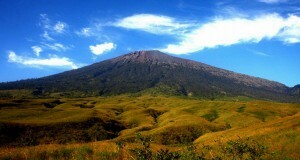 Until in 1883 a major disaster (the eruption of Krakatau Mountain) hit the region to reach the corner of the world. And the impact is only a bit of life in this region. After the destruction of Sudi Mampir area, several years later came the immigrants who came from Ciomas, Mancak, Pandeglang, Serang and areas outside Java such as Batak, Lampung, Padang and Riau. They started to build this area and called it with Anyar City and then turned into Anyer City. The fame of Anyer City itself began after the construction of a 621 mile Pantura road connecting cities in Java Island from Anyer – West Java to Panarukan – East Java by Governor Herman Willem Daendels. Although you can not surf, it does not mean you do not have the opportunity to ride the waves. Through bodysurfing, anyone can feel the same sensation without requiring a high level of balance. You can rent surfboards found here. Some spots have a charming underwater park. 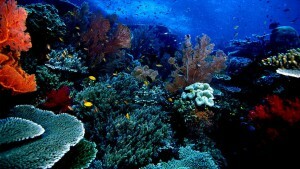 Unique coral reefs and colorful fish will keep you enthralled. Explore the underwater beauty with beloved family through snorkeling activities. You can rent snorkeling equipment at the rental around the beach. You and your family must try Banana Boat! 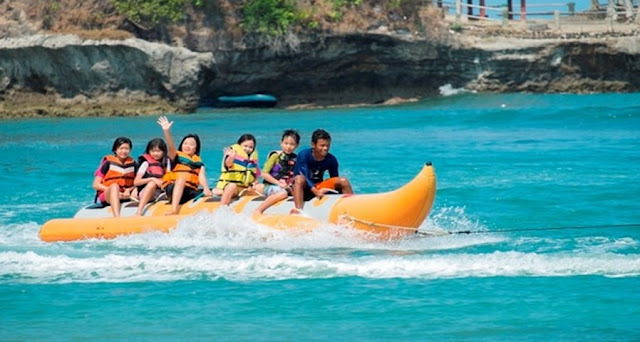 The banana-shaped rubber boat can contain 4 to 7 passengers. Banana Boat will be pulled by a rope attached to a motor boat. The faster the speedboats go, the more likely the passengers will fall into the water. However, precisely therein lies the fun. If you feel good driving on the mainland, maybe you are also good at driving on water. Prove it by riding a jet ski. Feel the thrill of riding the waves. Obviously, you are not necessarily taken off in driving Jet Ski. The guide will teach the techniques first, including how to spur gas and brake. Guides may accompany you while using Jet ski. The memorable story is not only created from the game above the waves. Being on the coast can be as fun as riding an ATV. It’s a motorcycle that has four wheels. Do it by pressing the lever with your thumb. Imagine you enjoy the afternoon atmosphere on the beach by riding an ATV, riding your child sitting in the back seat or the little one flanked in the front seat. Large tire wheels roll over the soft sand beach. A breeze caressing your face. What a wonderful moment. Some people choose to hurry home from the beach before going to bed. Are you one of them? At least once, do not miss that perfect moment with your dear ones, enjoy the moment when you look at the sun sinking in the western horizon. The golden embers of the waves were so dazzling. It seems there is no boredom looked at the beach panorama. So what if looking at it from a height of 246 feet? Certainly much more beautiful. Well, just come to Cikoneng Lighthouse. Make a little sacrifice by climbing 16 floors. Your fatigue will pay off when you see the sea sparkling in the sun. In the area of ​​Anyer Beach itself you find a lot of very comfortable lodging with scenery around a very riveting, Comfort in choosing lodging for a trip here is something that should not be ignored. And one of the comfortable lodging options around Anyer beach attractions is Patra Jasa Anyer inn. 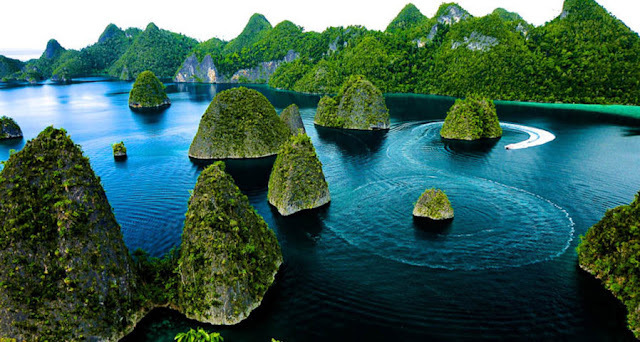 If you visit tourist attractions in Banten certainly not complete if not brought souvenir that many found there. And below are some souvenir and culinary that can be found around the tourist attractions in Banten. Typical Banten Batik, this one has a quite unique pattern, and most of Badui batik has only two colors that is black and blue. The popularity of batik is not inferior to batiks originating from other regions in Indonesia, so do not forget to buy batik from Banten when visiting the tourist attraction area in Banten Main Beach Anyer. This shirt has the theme of Indonesian nationalism, figures, philosophy and local wisdom of Banten. Designnya choice is very much with a cheap price and found in many distros around the tourist attraction Serang Banten. 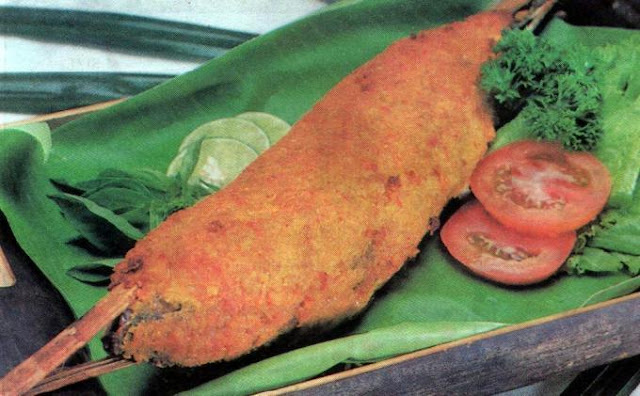 This culinary is a favorite of tourists who visit the attractions – Serang – Banten. Typical taste makes the right choice for you who have a high taste of food. Usually this satay is served with rice without using sambal sauce like satay in general. The number of visitors who come to the Anyer Beach, Serang Banten during weekends and long holidays make us not able to enjoy the natural atmosphere offered here. Besides, access to the tourist sites are crowded and tend to jam. For that it would be nice if you visiting the beach tourism object Anyer is not on the weekend or long holiday. 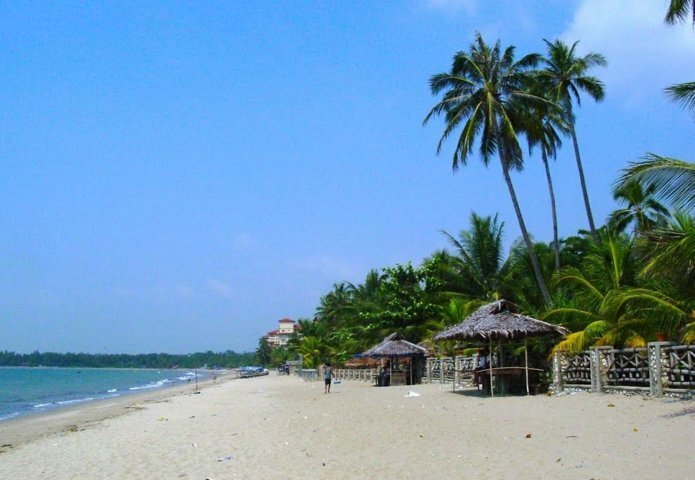 Visiting Anyer beach attractions using lodging accommodation is indeed the thing to do. 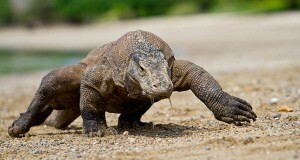 So we can unwind and continue enjoying and exploring the spots around Anyer beach. Visiting Anyer beach tourism object is very interesting if done with the battle-rampage for the atmosphere becomes more memorable. In addition, the cost for accommodation will be cheaper if we visit in groups. The number of spots offered here makes things that need to be addressed wisely. Why is that because every spot to be visited is subject to admission. So before you choose the spot that you think is best to visit so as not to regret after you go home.